About 18 months ago I was feeling the pull to create a new program. A program where I would teach my clients not only about the online way of working but also about the other side of business expansion — emotional and energetic mastery. Something that most online biz programs do a poor job of addressing, if at all. You see … you can teach people about online business models until you are blue in the face but if that person’s emotions, energy and base environment are conflicted or messy, they can’t translate their learning into effective real-world action. They never get off the starting block, have frustrating stop/start progress or they sabotage themselves in ‘interesting’ ways. So I created my Biz and Life Accelerator to address that void in the market. To create a program that taught the fuller story about online success not just the one-sided, left-brained side. And I brought in two very special people to help me – as well as their team of non-physical instructors! Those two people are Sheila and Marcus Gillette and the non-physical guides are known as THEO. Fast forward several months, and I felt the pull to create another program. A 7-week online course co-hosted with The Gillettes and THEO to focus on the ABCs of emotional mastery … within the larger context of the powerful planetary energy shift that is currently impacting all of us. That course, called Thrive in the Time of Awakening, is running right now, we just had our fifth session earlier this week. Now, I know I take a risk in sharing this information with my full list — as I have a very diverse group of people who subscribe to this zine. Not all of you are into considering information from non-physical sources! However I’m going to share a few highlights from the THEO information coming through as it offers an intriguing perspective on current world events and the trickle down on our own individual lives. With interesting guidance on how to thrive during times of intensity and acceleration. [Please Note: THEO communicates in very precise language. What I offer below is my own interpretation and high-level synthesis of some of the particulars being shared. I offer it as ‘the gist’ through my own filter. After the Thrive in the Time of Awakening course is complete, a digital product will be available with access to the audio recordings exactly as THEO delivered them]. For over 40 years THEO has been communicating that a powerful shift of energy and consciousness is occurring on our planet. In 2011, we are experiencing increased electro-magnetic energy provoked by strong solar activity from our sun and other forces in our galaxy and universe. This amp up of energy impacts our solar system (orbits and planetary tilts), our physical environment (volcanoes and earthquakes) our weather (temperature, storms, etc) our emotions (increased sensitivity and intense processing) and our bodies (physical sensations and symptoms). At one level these are frightening circumstances … however from the larger perspective a powerful, and helpful, reorganization can be observed. A needed realignment and rebalancing in environmental, social, political and economic systems is happening. Challenging to be in the midst of while it is happening, but foundational for what is lining up for the future. A proper foundation is being mixed and solidified … so enhanced, healthier structures can be confidently built upon it: i.e. internal revolutions with dictatorships (leads to fairer governance), economic recessions (leads to improved global financial systems), nuclear meltdowns (leads to safer/saner forms of energy creation), etc. THEO further shares that these electro-magnetic energies are intense and they impact our physical bodies and biology. Proper nutrition including minerals is more important than ever, as the arc up in energies depletes our systems. Which can leave us trying to operate with less than what we need to properly function (like a car without adequate fuel or maintenance). We need to keep personal chemistries as balanced as possible. Different people experience these energies in different ways. Typical symptoms can include feelings of acceleration, speeding up, pressure, frustration at things moving fast and not being able to handle them, irritability, lack of control and anxiety, apprehension and nervousness … in more unbalanced people even paranoia, suicidal thoughts, etc. On the flip side, we also have greater access to higher emotions — feelings of euphoria, contentment, illumination and calm. A real ‘back and forth’ of emotions as different aspects of our selves encounter the increased energy. THEO advises that the properties of water are helpful as a calming agent. Whether it’s taking baths and showers. Or being near large bodies of water – like steams, rivers, lakes and oceans. Water helps to balance out the effects of all this intense energy moving through us. Dissipate it and move it out of our personal systems. 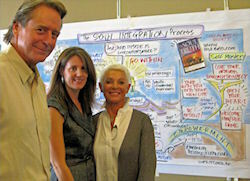 The meat of the Thrive in the Time of Awakening program is focused on THEO’s “Soul Integration Process”. Similar to shamanic practices like Soul Retrieval or psychological Inner Child Work, it offers a practice to identify and work through our emotional triggers in order to more fully integrate our personality and way of being in the world. With the ramp up of energy, more and more of us are being emotionally activated and triggered by events in our world and our individual lives. These activations are clues as to where our own personal inner work lies. As we do our own emotional integration work, becoming a master of our emotions and personal energy, we not only help ourselves but also help society and our species overall. We literally help create a shift in evolutionary consciousness. In previous blog posts I have discussed Soul Integration and more specifically the Orphan Rescue work that facilitates integration: Post 1 Post 2 Post 3. These original blog posts have developed into a revised map, step-by-step written and audio instructions – as well as several recordings of actual client sessions (generous participants who have allowed their Orphan Rescue Session to be recorded to help assist the understanding of others). It has been fascinating to witness these materials being used by class participants, all under THEO’s overall tutelage and with Sheila and Marcus’ co-facilitation. For me, that main things that I take from this precious work is the importance of growing and anchoring our mature consciousness. Placing our grounded, adult, integrated perspective into the center of our lives (in the CEO position) — not letting the wounded, abandoned, childish aspects of our nature run the show … individually or culturally. Also, I feel that the more one does Soul Integration and related work … the more one develops compassion for the human experience overall. We become more sensitive to when our orphans are acting out and have more awareness when others are suffering ‘an orphan episode’ too (“orphan” is the term that THEO uses to describe the fragmented parts of ourselves that act out). Over time, less judgment and arrogance occurs and are replaced with increased acceptance and understanding. A good thing for each of us personally and for our world at large.